The full article is behind a pay wall for me--hit my Facebook tonight. https://www.washingtonpost.com/news/acts-of-faith/wp/2017/01/28/the-mormon-church-which-prizes-religious-freedom-is-silent-on-trump/?utm_term=.8dc14deb0aab Also the church released this statement: http://www.mormonnewsroom.org/article/the-church-expresses-concern-for-those-fleeing-violence-war-and-religious-persecution The Church of Jesus Christ of Latter-day Saints is concerned about the temporal and spiritual welfare of all of God's children across the earth, with special concern for those who are fleeing physical violence, war and religious persecution. The Church urges all people and governments to cooperate fully in seeking the best solutions to meet human needs and relieve suffering. You get 5 free articles a month. Just dump your cookies and you should be able to view the article. The comments are very interesting and dispute the article. There are, of course, some anti- Mormon comments too. Thanks for the nifty trick, Rod. Did not know that. To be fair to the article, it was written about 3-4 hours before I saw the newsroom/DN article with the statement. I've been keeping close tabs on this because I'm absolutely appalled by the legislation that very much appears to be veering on unconstitutional and is an affront to religious freedom in its apparent discrimination, its drastic reduction of help to refugees, and its preference of one religious group over another. It feels as though it goes against some of our greater values based of of fear-mongering rhetoric. I liked the Deseret news article on this Here. I can also see how people could feel underwhelmed by the response. I wasn't particularly impressed by the short statement. That said, I also know that's not how the Church generally works in the sense of concerns that veer political, particularly with specific leaders (I don't know if I've ever heard the Church in recent history, call out any political leader). So I'm not surprised that the focused on a positivist message of working to help refugee populations, encouraging that in all governments, and leaving it at that. It gives wiggle room, particularly members, to decide what that means for them. People already have a tendency to allign the political ideology as some how church-ordained. As much as I would love a stronger statement, I get why they don't and do not want the Church to become partisan. Thanks for this tip! I run into this problem every month but am much too cheap to pay. Just an FYI, the countries that are on this list were identified by the Obama White house in a 2016 Visa Waiver Program. These were the countries identified needing heightened screenings due to terrorism concerns. More Cubans were trapped at border crossings due to Obama's Cuban policy change on Jan. 12 than were effected yesterday. Why didn't anybody care to show their despair at this surprise order by Obama and protest? I do not think it is unreasonable to temporarily ban or limit programs for 90 days or 6 months in order to make sure proper procedures and vetting are taking place. Why didn't the Washington Post wonder why Mormons were not responding to the Cuban situation? Trump did not institute a religious test to keep Muslim's out. Calling this a 'Muslim Ban' are completely false. Fifty countries are majority Muslim and only 7 are effected. Trump does provide for expediting Christian refugees who live as a minority and are being persecuted/beheaded. Is that wrong? I can't read Trump's mind, but he definitely talked about banning Muslim immigration while campaigning, so it seems that that is his intention. The order explains that in the banned countries, refugees from minority religions (ie Christians) may be admitted, so clearly it is targeting specifically Muslims from these countries. If it were really all about terrorism, presumably he would have put restrictions on the actual countries that have been responsible for terrorism recently like Saudi Arabia, not countries like Iran. I also wouldn't put it past him to be taking advantage of the fact that a lot of Americans not realizing that countries like Indonesia actually have more Muslims. A lot of (most?) people seem to equate Islam with Arabs. Whatever it is he's trying to do, it makes very little sense. Perhaps the article I read last night on this was wrong (random one I came across when researching something else), but if Trump did say as reported there that Syrian Christians would be given preferential treatment (his reasoning given was that they had been unfairly rejected before when the statistics are actually about equal between Muslims and Christians with the past admin according to what I read), then it certainly seems like the intent is to ban Muslims. "Trump does provide for expediting Christian refugees who live as a minority and are being persecuted/beheaded. Is that wrong?" Is there data that demonstrates deathrates of Christians are actually higher in these countries than their Muslim counterparts? "But here's the reality: While Christians in Iraq and Syria have been killed by ISIS, Muslims have been the group's victims far more frequently and represent the strong majority. Shiite Muslims are killed by ongoing waves of ISIS bombings of Shiite neighborhoods and Shiite members of Iraq's security forces have been victim to mass ISIS executions. But even as ISIS claims it fights for Sunni Islam, fellow Sunni Muslims have also been killed and displaced in greater numbers than Christians. That's, in part, because ISIS operates most in Sunni areas. Hundreds of thousands of Sunnis have been displaced from ISIS areas, as Sunnis, who try to oppose the group or have ties to the Iraqi government, are targeted. And, Muslims have fought ISIS more than anyone else. This includes Kurdish Sunnis and Arab Sunnis and Shiites, who are on the front lines and often allied with U.S. advisers in the battle against ISIS, as well as Turkmen Muslims. Some of the most horrific videos from ISIS have shown the killing of Sunni Muslims who have fought the group, like a Jordanian pilot and Turkish troops shown burned alive. Certainly, it's the case that Christians were terrified of ISIS and fled. ISIS has desecrated churches and shrines. Some Christians have lived in ISIS-controlled areas and paid a tax to the terrorist group. And there have been Christians killed and kidnapped — 88 Eritrean Christians from Libya who were kidnapped by ISIS in 2015 two months after 28 Ethiopian Christians were executed; 262 Assyrian Christians kidnapped from the Tel Tamer area in Syria and held for ransom; 50 killed in Tel Tamer in suicide bombings. But that pales in comparison to the mass murder of Muslims — massacres in Iraq; 1,700 Iraqi air force cadets executed or missing from Camp Speicher, a former American military base near Tikrit; the slaughter of hundreds of the al-Sheitat tribe in Syria; and the massacre of Syrian army POWs at Tabqa in 2014. That's not to mention the hunting down of Yezidis." "Mr Trump’s claim that Isis has targeted Christians over other groups with its beheadings also appears to be untrue. The group has released gory propaganda footage showing mass decapitations of Ethiopian Christians and Coptic Christians in Libya in 2015 but several other massacres on a similar scale have targeted Syrian soldiers and rebels, Kurdish fighters and Iraqi soldiers, all believed to be Muslims. In the territory it controls across Iraq and Syria, Isis’ brutal interpretation of Sharia law also allows for the beheading of local residents on allegations of spying and sorcery, among others. Isis claims to be fighting a holy war against other Muslim sects, Yazidis, Christians and the “kuffar”, or disbelievers. While al-Qaeda leaders considered attacks on Shia civilians too extreme and detrimental to public support – as well as a distraction from its jihad against the West – Isis has made the massacres a priority, targeting symbolic shrines, holy cities and pilgrimages as well as packed markets. Shias were also the main victims of Isis’ deadliest ever attack in Iraq, when militants were reported to have massacred at least 1,500 air force cadets at Camp Speicher in Tikrit in June 2014. A handful of survivors recounted jihadists separating Shias and other religious minorities, driving them into the desert and lining them up on the edge of a mass grave before opening fire. The atrocity was one of countless massacres inflicted upon government forces and civilians in Iraq, where almost 7,000 people were killed and 12,000 injured in more than 2,400 attacks in 2015, according to the US State Department. The Global Terrorism Index ranks it as the country worst-affected by terror, followed by Afghanistan, Nigeria, Pakistan and Syria – all Muslim-majority countries. There are no definitive figures on the number of Muslims or other religious denominations killed by Isis but the huge number of victims in Iraq, where 95 per cent of the population is Muslim, suggests that the religion makes up by far the largest proportion of the dead. A 2011 report by the US government’s National Counter-Terrorism Center (NCTC), said: “In cases where the religious affiliation of terrorism casualties could be determined, Muslims suffered between 82 and 97 per cent of terrorism-related fatalities over the past five years.”"
If Trump includes Shia and other Muslim religious minority groups in his exemption, it would seem less targeted at Muslims. If he doesn't, more targeted. Anyone know what the process is to determine one is a Christian and how difficult it is to lie about it? 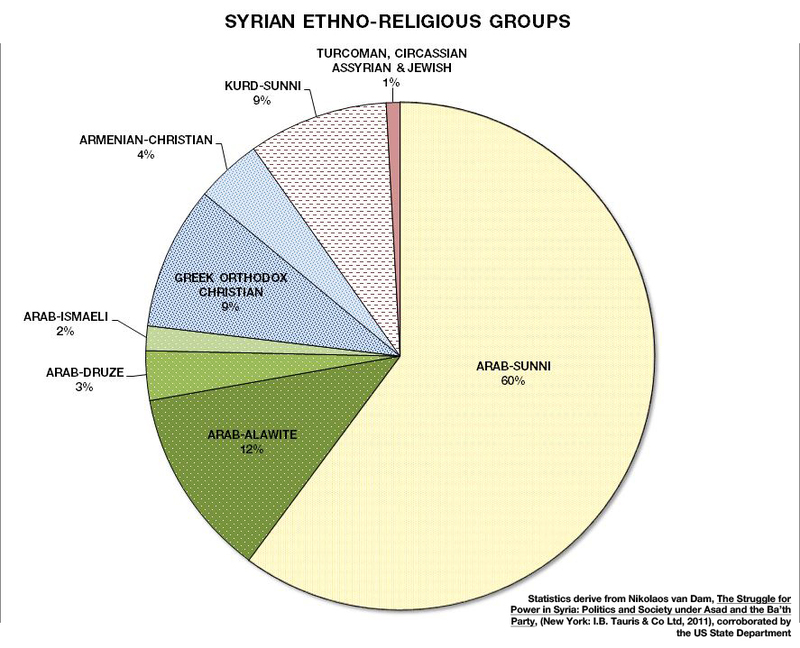 I think most Christians in Syria are part of the same ethnic group, "Assyrians," and so have distinctive customs and often speak Aramaic instead of Arabic. Other than that, I have no idea how you would be able to tell the difference. You can make a good argument though that ISIS followers (whom american wants to be protected against) are unlikely to mask themselves as Syrian Christians, and therefore the relative risk of admitting real Syrian Christians (who are likely to die if so identified or suspected by ISIS) is acceptable. Why assume that ISIS followers who are willing to be violent and even kill others are not willing to lie about what they believe to do so? Experts say another reason for the lack of Christians in the make-up of the refugees is the make-up of the camps. Christians in the main United Nations refugee camp in Jordan are subject to persecution, they say, and so flee the camps, meaning they are not included in the refugees referred to the U.S. by the U.N .“The Christians don’t reside in those camps because it is too dangerous,” Shea said. “They are preyed upon by other residents from the Sunni community and there is infiltration by ISIS and criminal gangs.”“They are raped, abducted into slavery and they are abducted for ransom. It is extremely dangerous, there is not a single Christian in the Jordanian camps for Syrian refugees,” Shea said. According to one of the articles, Christians are being more protected in Syria recently due to Assad wanting to appear a protector of minorities. Also, Muslim areas are the ones being attacked so more likely to have refugees. I don't know if true, but I suspect whether one believes they are more persecuted than othe minority faiths including some Muslim groups or less due to not being in the worst areas as many minority Muslims are that a straight percentage of population isn't truly reflective of who needs more protection and who is getting it. Anyone have numbers of percentage of Syrian applicants that are Christian as opposed to Muslim and Muslim breakdowb into minority faiths that are being targeted by ISIS? Hopefully the order will not just apply to the Christian minority, but all minorities that are at risk.